Cormac McCarthy’s The Counselor is a film comprised entirely of dialogue and brutally matter-of-fact violence, wherein characters communicate via Shavian monologues and aphorisms. On another level, it’s a film wherein everyone talks about decapitation, and then everyone gets decapitated. I wish I meant it more figuratively. The narrative itself plops us into the middle of a business deal that has been in the works, in some form, for about two years. Exact details are sparse, but the Counselor, an unremarkable lawyer whose greed has finally gotten the best of him, has invested in a drug deal with a four-thousand percent return rate. His partners include the aforementioned Reiner, a posh mogul in the underground club scene; a blowhard cowboy named Westray (Brad Pitt); and most importantly, Malkina (Cameron Diaz), an unbridled sociopath with a traumatic past and a nearly full-body tattoo of a cheetah. Malkina is named after the Grimalkin, an evil faery cat in Scottish mythology (during the infamous witch trials, many women were preposterously accused of using the Grimalkin as a familiar). The other players are the Counselor’s painfully naive girlfriend, Laura (Penelope Cruz), who has no idea about his goings-on (and is thus destined to be a sacrificial lamb because of them); The Wireman (Sam Spruell), a simultaneously theatrical and stone-faced mook working for Malkina; and of course, the shadowy Cartel, who are never portrayed as much more than ill-tempered and bumbling grunts (with the exception of a high-ranking member played by Rubén Blades), but who, in the words of Westray, will “rip out your liver and feed it to your dog” in the event of a misstep. Other vital but briefly-seen characters appear; I’ll get to them later. The Counselor performs a legal favor for Ruth (Rosie Perez), a client currently in prison, whose son, a biker known as the Green Hornet (Richard Cabral), is a cartel member involved in transporting the cocaine – unbeknownst, of course, to the Counselor, whose involvement in the Hornet’s case is the Inevitable Fuckup that catalyzes the film’s tragic narrative thread. When the Wireman assassinates the Hornet and steals the cocaine, everyone’s crosshairs gravitate toward the Counselor (which is a bit of a surprise, given his apparent knack for keeping his name a secret, but everyone knows that in the movies, two organizations are always invincible and omnipotent: the Mafia and the Cartel). He asks everyone what to do. No one knows or cares. The wealthy Westray can make himself disappear if he likes, so he travels to London in order to waste time until everything blows over. These events unfold on minimal sets, and through dialogue clearly meant for the stage. People say big things, and you know that in this world, they’re right. Irrelevant characters (albeit played by great actors like Toby Kebbell and John Leguizamo) are shoehorned between important scenes to pontificate about some broad concept. While this approach to dialogue is pragmatic for this type of narrative and quite pleasant to listen to, I’m not sure I’d call it “good.” It’s indulgent. McCarthy’s characters resemble Greek gods, or some other beings that know more than regular humans do and stage their battles in a world separate from everyone else’s – note the names of the ancillary characters – The Blonde (Natalie Dormer), The Buyer (Dean Norris), The Diamond Dealer (Bruno Ganz), The Priest (Edgar Ramirez) – people named for roles and functions. The Blonde exists to distract someone. The Buyer exists to buy the cocaine (and give narrative satisfaction to, quite literally, the only bit of plot movement). The Diamond Dealer exists to sell a diamond to someone important. 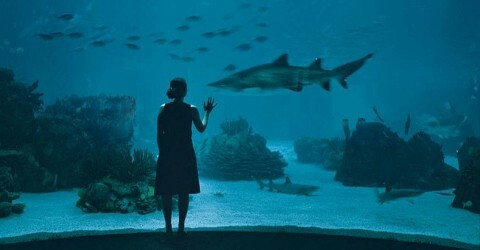 Someone more important will receive the diamond, and someone even more important will notice the diamond later. The female characters are either stereotypically innocent and helpless, or sexually manipulative and calculatingly evil. In and of itself, this is irresponsible and clumsy, even for (perhaps especially for) such a forwardly “masculine” writer as McCarthy, but consider the fact that none of the male characters are very layered either. The Counselor is the everyman. Reiner is vanity. Westray is misplaced confidence. The Blonde is a succubus. Malkina is death. I’m sure you could find a tarot card that corresponds to everyone in this story. I’d never excuse badly-constructed female characters, and there’s no excuse for a story populated entirely with thin characters, but I guess I’m thinking about intention here – not that the writer’s intentions aren’t transparent or shopworn, but I still can’t help but imagine this same story with this same dialogue taking place in an arena theatre. Cameron Diaz digs up a performance so commanding that one wonders why she has been so heavily relegated to funny love interest roles and self-conscious cameos. I am lucky to have seen this film, but I’m not sure I could see it again (I had similar feelings about the adeptly-constructed Shame, also starring Fassbender). All the wrong people are killed, and not ironically. Death scenes are dragged on until the character bleeds out, and if that doesn’t take long enough, it’s shown in slow-motion. The excess of the violence would be laughable if not for the film’s hopeless tone and the way the blood brightens against the black and yellow deserts and cool cityscapes, which are so bland they may as well be black-and-white. 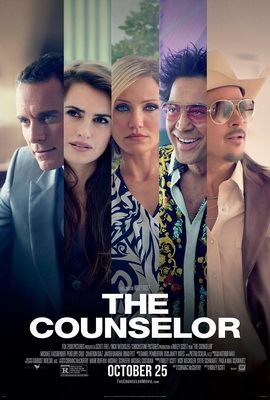 The Counselor (2013); written by Cormac McCarthy; directed by Ridley Scott; starring Michael Fassbender, Cameron Diaz, Javier Bardem, and Penelope Cruz.